We recently spent a week visiting Smith Mountain Lake in Virginia and hit up nearby Roanoke on several occasions during the week. While we have visited Smith Mountain Lake many times before, we spent more of our vacation in the city of Roanoke on this particular trip and enjoyed some new-to-us places. The few attractions below are perfect for any family friendly adventures and a great reason to visit the Roanoke area! Mill Mountain Zoo - This is the one place that we visited that was actually not new to us on this particular trip. 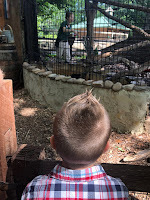 Mill Mountain Zoo has been a favorite of ours on each trip we have taken with the kids. 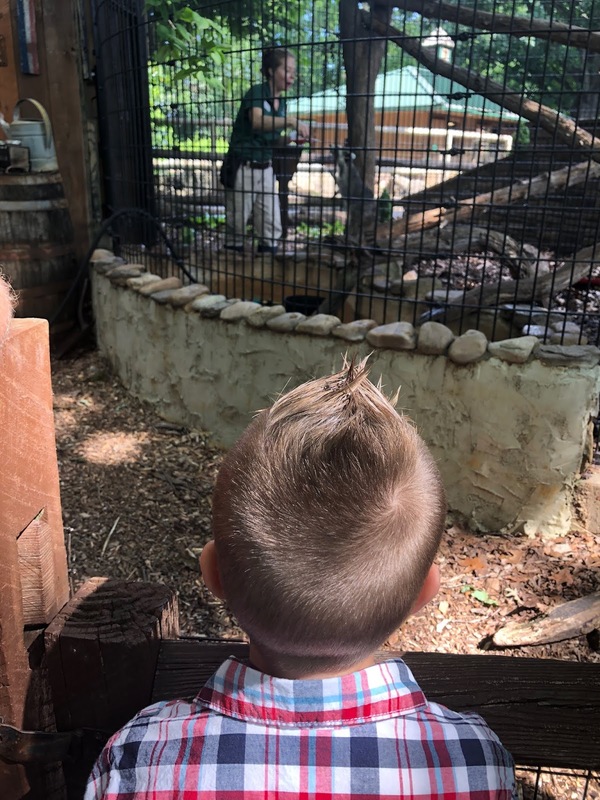 Nestled in the mountains, this zoo provides a picturesque view of the city of Roanoke and a secluded, natural feeling to your animal encounters. The zoo itself is small, but with small children that's not a bad thing. The small town feel of the zoo allowed for a lot of great interaction between the kids and the zookeepers at the chats and feedings. Admission to the zoo also includes a small "choo-choo" ride around the perimeter which my boys really enjoyed. There are no dining options inside the zoo, but you are welcome to bring in a packed lunch or snacks. We typically spend between 1 1/2 to 3 hours here. Splash Valley Water Park- We've had our eye on this water park during previous trips, but hadn't found the time in our schedule to visit until this summer. . .and we are so glad we did this time around! The water park is part of a recreational center in Roanoke, so the size is not something that will wow you when you arrive, but believe me when I share that there is more than enough fun to fill the day. We arrived when the park opened at 10 and stayed until about 5. There are two waterslides for older kids and adults to enjoy, a smaller slide perfect for the elementary school set, and a water playground with fountains and geysers. There is plenty of space to swim in shallow water and a small current based loop that can serve as a lazy river. We had to practically peel Brody off the smaller waterslide and Caleb loved the zero entry splash area. My hubby and I even felt like kids again taking turns on the big waterslides. The water park was busy with summer camps and families, but never felt overcrowded. There was also a nice assortment of food - pizza, chicken tenders, hot dogs, fries, ice cream, chips, etc. - at the snack bar. I saw kids of all ages enjoying themselves and I know we'll definitely be back in the future. Kid's Square Children's Museum - We had several rainy days on our vacation which left us searching for some indoor fun. On the way through town, we had picked up a brochure about Kid's Square and decided to give it a try. The museum is located inside Center in the Square in downtown Roanoke which is home to four museums, a theatre, and a pretty cool aquarium display on the lower level. You can purchase a combo ticket to visit all four museums or purchase admission separately. With our boys being so young, we decided to stick to the children's museum. It is located on the third floor of the building and at first glance looks like it might be something to occupy children for 2 hours or so. However, once you begin exploring it is easy to get lost in all it has to offer. Among the favorite attractions for our boys was the play bank, the TV studio, and the "sand" pit. Plus, there is a roadway through the museum where kids can ride cars. We spent the morning playing, went out to a restaurant across the street for lunch, and then came back for several more hours. This was a great rainy day find and is perfect for kids 8 and under in my opinion. Spring Valley Farm - Located near Smith Mountain Lake, Spring Valley Farm in Moneta was another gem we discovered this trip. On another cloudy, questionable day weather wise, we called up and booked pony rides for the boys. The farm is absolutely beautiful and the staff couldn't have been nicer to meet that day. Brody hopped right on the pony for his ride around the barn area. Caleb was a little more shy, but the staff was patient and worked with him to get comfortable with riding. After they were done the rides, the boys got the meet a few animals in the petting zoo area and were even introduced to a "zorse." Yes - that's right - a zebra horse! It was pretty awesome. The morning was thoroughly enjoyable and we can't wait until the boys are a little older to visit again and take one of their trail rides! Links are included above for each of these! I received no compensation for visiting these places, just happy to share some great finds with those of you that might be traveling in the Roanoke area with kids. Enjoy! !